Yes, Hudsons The Burger Joint Stellenbosch is a paradise for burger-lovers, but have you seen everything else on their menu? More than burgers? Hmm, maybe it’s the name Hudsons The Burger Joint that’s misleading. Because Hudsons The Burger Joint in Stellenbosch is about so much more: a varied range of good foods, including some you can also gladly recommend to your vegan friends. 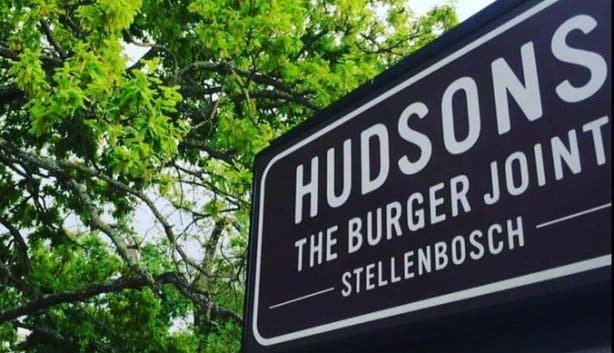 So what sets Stellenbosch apart from the other Hudsons The Burger Joints across the Western Cape? It is perfectly situated in the popular Dorp street and from the large patio area, you overlook the hustle and bustle of Stellenbosch. This is the perfect place to stop off for a delicious meal after doing wine tasting or while on a scenic drive. And don’t fear if the weather is chillier, they have a comfy indoor area where you can dine as well. The indoor area has a relaxed urban feel, synonymous with the trendy student town of Stellenbosch, with furnishings of wood, leather and textured walls. Expect to hear soft rock music playing in the background as you enjoy your tasty meal. 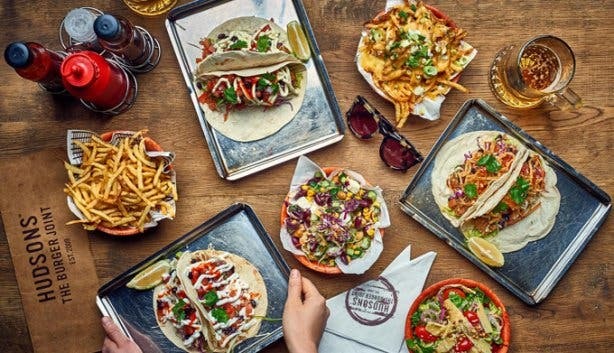 For those of you, who live on the vegetarian side of life, Hudsons The Burger Joint has additional options such as the soft flour falafel taco with jalapeno, coriander, salsa, guacamole and fresh sriracha with yoghurt dressing (the yoghurt can be eliminated for vegan patrons). All burger patties can also be swapped for vegetarian patties, so non-meat-eaters can enjoy the same delicious experience while adhering to their dietary requirements. 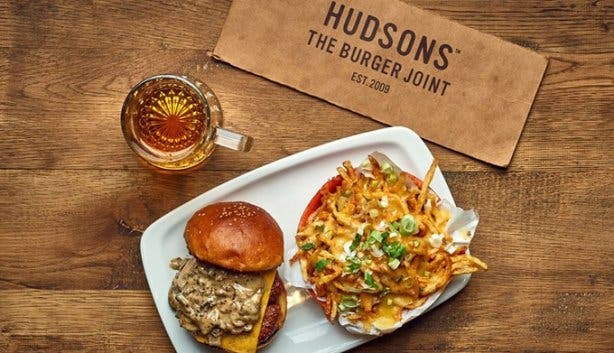 Even though Hudsons The Burger Joint is so much more than burgers, we have to highlight just how great their burgers are. Hudsons The Burger Joint has about 20 unique creations such as The Original Royale, which contains bacon, chilli and onion rings; or The Boss, which has BBQ beef rib meat and dill pickles; or the ever-popular Vanilla Thunder – a grilled chicken breast with crumbed mushrooms, blue cheese and rocket. Even if you aren’t a fan of beef, Hudsons The Burger Joint has the option of replacing the beef patty with an ostrich or vegetarian patty at no additional cost. If you aren’t keen for a burger on a bun, you have the option to have your meal served a bed of lettuce. 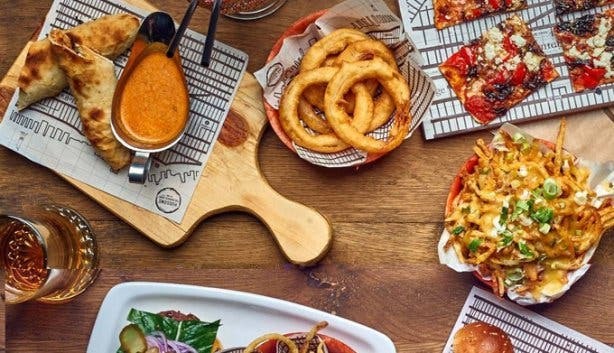 And if you are not in the mood for burgers, Hudsons The Burger Joint has an arsenal of food options to choose from: delicious salads such as The Great Girl – lightly seared beef sirloin, avocado, roasted beetroot and butternut; BBQ beef ribs; chicken wings; nachos; sirloin steak; and a selection of pizzas. Even yummy desserts such as waffles, brownies and deep-fried Oreos with ice-cream are on the menu. From the usual cocktails such as mojitos and strawberry daiquiris to their own concoctions like Grapefruit Crush, which is comprised of grapefruit and vodka, or the Pink Lady – a Whitley Neill gin with pink Fitch & Leedes tonic and candyfloss. They also cater to those who are not cocktail fans with various beers, wine and champagne and shooters. They even have a “Make Your Own G&T” where you can choose your own gin, tonic and fruit and mix your perfect drink for just R69. For the kids and those who do not indulge in alcoholic beverages, gourmet milkshakes are offered alongside the usual coffee and cool drinks. 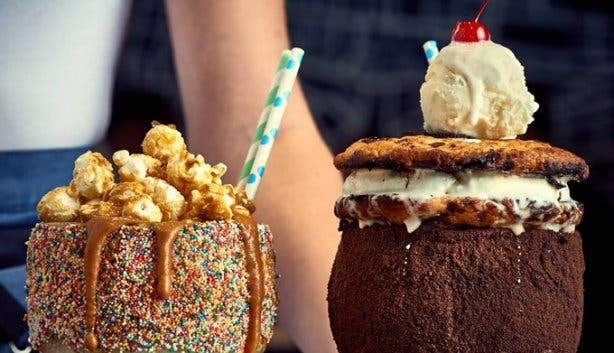 There is a choice of interesting milkshake tastes such as Strawberry Candyfloss, Salted Caramel Popcorn and Lindt Chocolate Brownie, and it is worth every sip. Looking for some excellent specials? 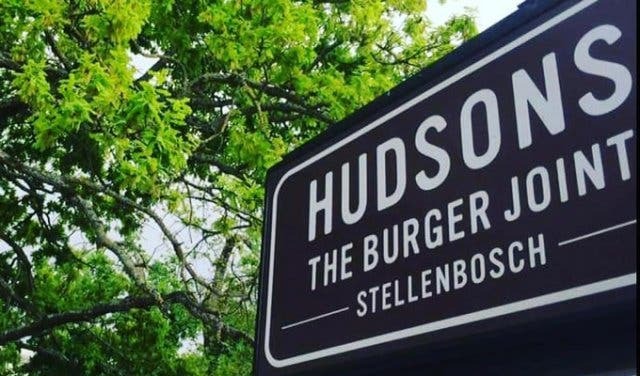 Get a great deal with Hudsons The Burger Joint Stellenbosch’s Slider Thursdays or their everyday Happy Hours. Also, indulge in our choice selection of yummy burger spots in and around the city. From margaritas to Long Island Iced Teas, you’ll find here a special selection of delectable cocktail spots in the Cape. Celebrate your birthday right with our look at some of the most unique places have your next birthday party.